Several newspapers in Kenya have launched scathing attacks on the Sudanese government over the conflict in the troubled western region of Darfur. One influential daily called the Sudanese government "racist... and undemocratic". This hardening of language comes as Kenya plays host to long-running peace talks between the Sudanese government and the southern SPLA rebels, which are now being overshadowed by the Darfur crisis. A commentary in The East African Standard described what is happening in Darfur as a "pogrom" committed by "the racist, fundamentalist and undemocratic Sudanese state". "The Darfur pogrom is part of a historic continuum in which successive Arab governments have sought to entirely destroy black Africans in this bi-racial nation," the paper said. "What is required for peace in Sudan is either regime change... or partition." The paper urged the African Union and the Arab League to stop their "hypocrisy" and to take more robust steps to end Khartoum's "genocidal policy" in Darfur. Another Kenyan daily The People called for an investigation into charges of ethnic cleansing in Darfur. "There is... a need for an international commission of inquiry... to examine evidence of war crimes, crimes against humanity... as well as allegations of genocide." Kenya's most popular paper, the Daily Nation, also joined the debate. Its commentator accused Sudanese President Omar al-Bashir of creating the Arab militia group, the Janjaweed, to carry out the alleged ethnic cleansing campaign. "The Janjaweed are President Al-Bashir's creation," it argued. "It is stupid for a government to let thugs loose." 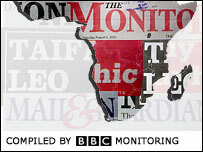 BBC Monitoring, based in Caversham in southern England, selects and translates information from radio, television, press, news agencies and the Internet from 150 countries in more than 70 languages.